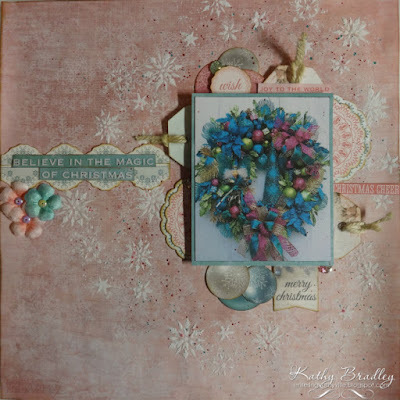 This page was made using papers from Kaisercraft's Silver Bells collection - and I found a pic on Pinterest to use with blues/pinks. So very pretty Kathy! Love all the snowflakes surrounding that pretty photo! Gorgeous Kathy, a beautiful composition around that photo! Love the snowflakes! Oooh, what a beautiful layout. I love the pretty wreath and all the elements of your page. This is gorgeous Kathy! I adore the colours you used!